Used ATVs for Sale - Buyer's Guide to Help You Find the Best Buys. Used ATVs for Sale - Buyer's Guide. Have you been looking at used ATVs for sale? Not quite sure what you need to be looking for? What makes one used ATV a best buy and another one a complete dud? We answer these questions and more in this guide to help you find the best used four wheelers. First up - the Buyer's Checklist. Use this to help you separate the best used ATVs from the rest of the pack. To help get a good idea of what's available and what they're selling for, we like to browse the Ebay Motors auctions. Just click the link below if you want to take a look. Tips for buying used ATVs. Look at the surroundings - Notice the condition of the seller's house and yard, personal vehicles, etc. Is the garage or shop clean and organized? Are the house and yard well maintained? Personal vehicles clean and neat? Usually if the owner's personal abode and vehicles are well cared for - then his ATV will be too. I've never bought a bad vehicle from someone whose personal possessions were immaculate. It's not in their nature to let maintenance and repairs go undone. If the seller's private property looks like it should have a condemned sign posted - you probably need to just keep driving. The concept of maintenance and repair is just not on their radar screen. And that will include any used ATVs for sale they happen to have. Other than buying a used four wheeler from someone you know, this is the best advice we could give you. Trust us - if you limit your searches to the first types of people you will save yourself a lot of headaches with a used ATV. Everything else will seem to just fall in place. Look at the ATV - If you followed our advice above you won't have as much to worry about on this part - but we'll go through the list anyway. Check the VIN number. Make sure that it has one and that it looks original. If it looks like it has been replaced or scratched off - it could be a red flag indicating a stolen ATV or a rebuilt wrecked one. Write the number down and check with a dealer to make sure everything is as it should be. Correct year, model, options, etc. Look for performance modifications. Performance accessories aren't a bad thing by themselves, but it does indicate how the ATV may have been ridden. Mods for mud riding is a definite red flag. 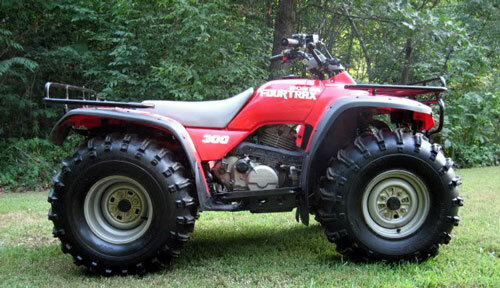 Mud and deep water can considerably shorten the useful life of an ATV. It's also a good idea to look for heavy duty modifications and accessories like trailer hitches, plows, etc. Heavy utility work can be just as hard on used four wheelers for sale as high performance riding. Oversize wheels and tires can strain the driveline, bearings, suspension, brakes, and engine. Modified computers can raise the rev limit of the engine, causing extra wear. Lift kits can cause more wear to axles and suspension. Not all ATV modifications are bad though. Things like upgraded air filters and exhaust systems are fine. Same goes for better tires if they're close to stock sizes. Aftermarket racks, bumpers, seats, winches, etc. are generally not a problem. Check the general condition. Look past the obvious stuff to find the little tell tale signs. Mud and dirt in hard to clean places. Scratched or broken plastic. Scratched and dented bumpers and racks. Cuts on tires. Damaged body mounts or missing pieces of bodywork. Rusted hardware. Bent or broken controls. Anything that gives you clues as to how the ATV was used. Ask the owner about any repairs that have been done. Get all the details you can about any repair work that was done. Supporting paperwork like invoices and work orders are nice if the owner has it. You can also look for scuffed bolt heads, pry marks on mating surfaces, and other signs that repair work has been done. Ask about the previous owner. Get contact info and give them a call if possible. See if the dealer offers any sort of warranty or grace period on their used ATVs for sale. It's a little harder to judge the condition of an ATV at a dealership because they usually have them detailed pretty thoroughly. It's still worth looking in all the little hard to get at places for clues anyway. Most dealers only keep models in the best condition as used ATVs for sale. They don't really want clunkers on their lot because it just doesn't look good. In fact if a dealer does keep used ATVs in bad condition, you might want to look for another dealer. Check the blue book value of the ATV. You need to make sure that the dealer's asking price is in the ballpark. Some will have outrageous prices on their used ATVs for sale. That's done to make a few extra bucks from people that don't know the true worth of the ATV. Compare prices with new holdover models. If you're looking at 2 or 3 year old used ATVs, it's a good idea to see if any dealers have new models from those years. We've seen times that a new left over model was priced less than the asking price for a used model!